On May 20th, 2014 this formation appeared around Roosendaal Nederland. it was a highly symmetric area with precise walls and corners. Concentric circles lined the central region, displaying a very high likelihood of being made from a vantage point above the field. Unfortunately, the farmer who owned the field did not want people on it for long, and had plans to mow it in the coming days. Harsh lines flanked the cutout in this field, as we quickly discovered very specific lines with a high degree of geometric symmetry in this field. Very indicative of someone with a high vantage point making this circle with precision. Appeared on June 10th, 2014. These circles had a very particular kind of form. Large ovals with a precise circle in the central region of the field. This was very similar to one seen last year, except much bigger than typically seen in Nederland. August was a very productive month for the Circle Makers in England. 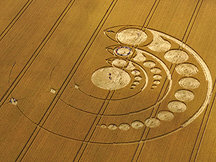 Dozens of simple and complex circles appeared. This is a catalog of the August 2014 circles as they appeared and includes a description of the circle, when it was noticed, and aerial pictures if available. There were many formations that appeared in the Netherlands in 2014. Many rings and circles appeared in these formations with numerous commonalities. On a few days during the year, multiple formations appeared in the same day. There was a high degree of activity this year compared to years past. 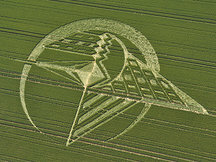 Circular Site is an educational website with the aim of disseminating information about the crop circle phenomenon. 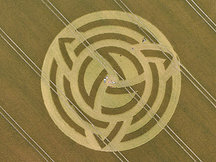 In order to more easily bring the crop circle phenomenon to the attention of 'the public', Circular Site organizes lectures, workshops, exhibitions and tours to the crop circles in southern England, where they are most active typically. Circular Site is dedicated to Janet Ossebaard: crop circle researcher, photographer and author since 1994.